We understand that YOU only need 1 buyer to buy your home. The Wesley Firkin Team spends thousands of dollars every month on advertising listings in an effort to secure buyers for our sellers. Now we are offering 3 of these very powerful buyer lead generating systems FOR FREE! 1. A Sleek Property Website - Example Click Here: 529 Constitution Drive - Website A wealth of information including school, shopping, and area amenities. A mortgage lender ready to provide pre-qualification. 2. Social Media Blitz - Example Click Here: Facebook Posts & Ads we are also investing $1,000 month on paid FB Ads that generate over 200 buyer leads per months for our listings. Our Linked In page consists of over 6,000 contacts most of which are other realtors who are searching for off market homes for their buyers as well. 3. Curbside Lead Generation - Example Click Here: Voice Pad Platform A robust system for buyers to Text for information, have the property sent directly to their cell phone, and be listed on Craigs List. 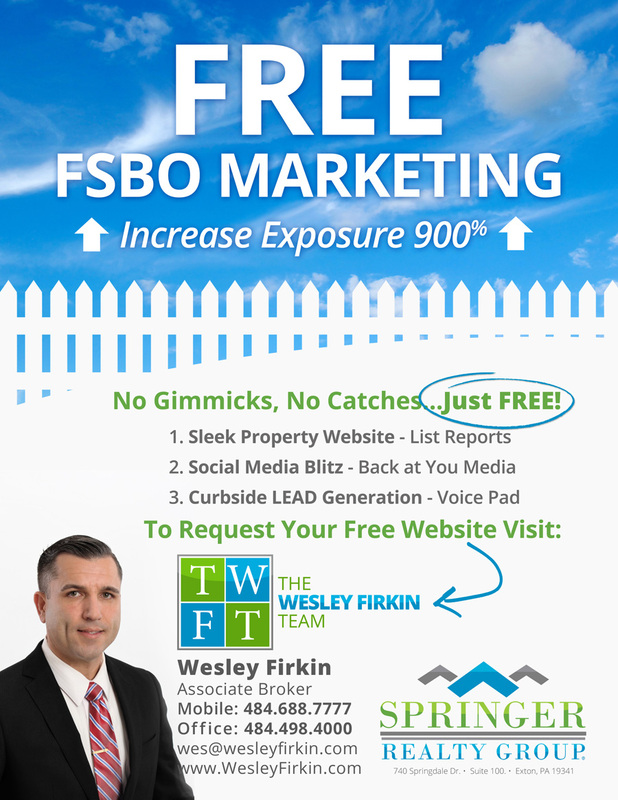 YES I WANT TO INCREASE MY EXPOSURE 900% FOR FREE NOW: Free FSBO Marketing - Sign Up Now! 1. You save at least 50% of a real estate commission if we bring you an acceptable offer from one of the dozens of buyers we will generate from these systems. 2. You see how we leverage technology and systems to market our listings and buyers come from listings. We do all the work and bear all the expense because this is our expertise. We believe in the Give, Give, Give philosophy. We believe that in our giving free marketing to you, you will in turn spread the good word about our Team. 3. In addition to increasing your exposure 900% or more, we will provide you a lot of other tips in getting top dollar for your home. We will never ask you to list with us and we will never give you a high pressure sales pitch. Statistics show that 1 out of every 15 buyer leads we generate will buy a home with us. So if they don't choose your home first, we know we will help them find their dream home. So it truly is a WIN-WIN.